Štepalica: Where did I learn to sew? Where did I learn to sew? "Where did you learn to sew?" I've been asked this question by both - the ones who sew and the ones who'd like to learn to sew. Those who sew but aren't very satisfied by their skills and would like to improve their knowledge often do not know where to start from. The ones who'd like to learn to sew are even more confused - they expect perfect results from the start. In my case, the truth is I was self-taught. I started sewing twenty years ago, during a summer holiday when I was in a high school. I was 15 and I had no clue what I was doing. The following thirteen years I sewed by a hunch and learned from my own mistakes. In time I got neater and better, but I still made some serious mistakes while sewing. I didn't know how to alter patterns to make the clothes fit me nicely - the pants were always sitting too high on the waist at front, while at the back they sat too low due to my protruding rear. Also, most of my garments simply screamed - hand made. I didn't pay enough attention to details - I omitted sewing vent pockets on all the garments, since I didn't know how to make them nicely. If I wanted to have the pockets, I would disguise them under a large pocket flap so that it wouldn't show how lousy they were made. I didn't bother making belts, belt loops, epaulettes and similar details that make a jacket look rich and professionally made. And even if I would force myself to make them I would do it sloppily. I was guided by a principle - "however it turns out, it's OK". I wasn't aware of the fact that I could control the pattern and alter it according to my body. I was a rather fast and nervous seamstress, speeding up to finish a garment in order to wear it as soon as possible. I avoided fixing the errors I had made while sewing, thinking that pressing would fix the slight pulling by a lining or flatten the gathers that I made by a mistake. It was a big mistake, typical for most of the beginners! And then 2008 happened, a year that was really important for my sewing career and skills. First I became a member of Burda Style website, where you can find a section with tutorials about various sewing techniques, which I browsed through for months. I think I stopped visiting the website on a daily basis only three years ago; until then I would spend several hours a day browsing through the numerous pics of other people's creations and looking for interesting information. One of the ways of learning was to look at creations, analyze details and compare the used techniques with the ones I was using. The other way of learning was, and still is, trying out new techniques and practicing. 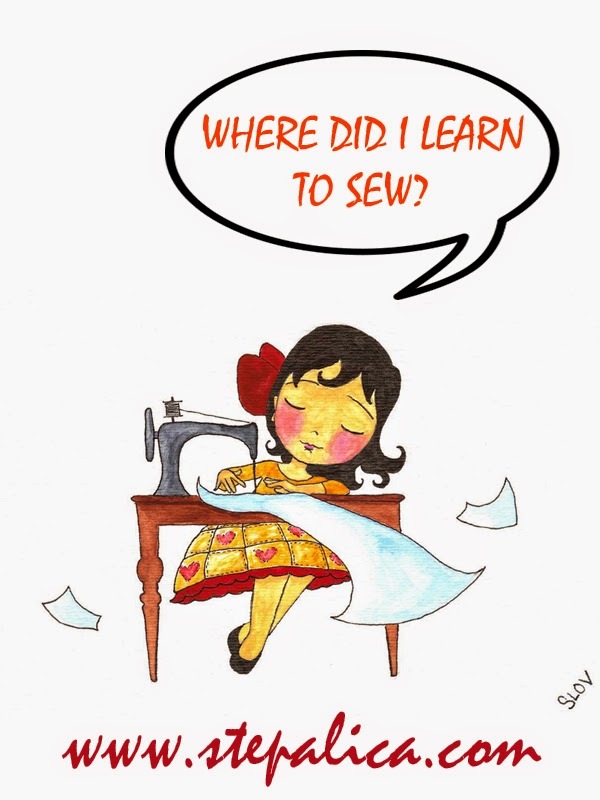 Soon afterwards I discovered a whole new world of sewing related blogs, where I found a lot of information and tutorials about sewing, with lots of details, pics and illustrations and step-by-step descriptions. The first blog I discovered was Laura's sewing room, where I found several techniques about sewing shirts as well as great instructions for sewing a lining to a jacket. Unfortunately, Laura is not as active with her blogging as she used to be, since she became a mom, but I do hope she'll start writing again soon, since the woman has a lot to show. After that I discovered Tany and her blog Couture et Tricot. I've learned a lot from her - she writes very detailed posts about sewing and she sews impeccably. I think her blog influenced me the most and was an inspiration to me when I started Stepalica - I wanted to show the same level of details and perfection in my work and on my blog. Tany has also been less active in the last two years as she got a baby, but she's started showing off her new creations recently, which is great. Then it was Bunny and the blog La Sewista! I was amazed by the smocking and her attention to details. I think it was her blog where I first saw a collar finished by a bias band. Bunny frequently sews gorgeous dresses for her grand daughters, which are works of art. I have to say I was really honored when my blog caught her attention and when she started following me and commenting my work. A great thing is Bunny posts frequently and displays her new creations. I am very fond of Sigrid's blog. I got ideas for some of my creations from her blog more than once. Sigrid also writes useful tutorials, and she used to run a separate blog that featured numerous tutorials collected from various sewing blogs. I follow a lot more blogs from which I still learn, and I'll list those that have made the greatest impression on me and that I've learnt the most from. These are the blogs I that inspire me, some give me new and fresh ideas for sewing, the others give me inspiration for writing my own tutorials. Along with the blogs, I follow Sew News and Threads magazines' websites and I surf through Pinterest a lot, looking for interesting techniques and instructions, that I pin to a separate board of mine. So, these are my sources of knowledge and inspiration. I've given you a lot of recommendations and sources of information to start from. Have on mind that sewing is, like any other craft, all about the practice - the more you use a certain technique, the better you'll get at doing it. Finally you'll master sewing well enough to perfectly execute a technique you've never used before, but have only read about it. It happens to me all the time, and with every new method I (successfully) execute, my self-confidence raises. I'm sorry I don't have the garments I made ten or more years ago, to show you how differently they were made compared to the newer ones. Of course, the new garments are much neater and prettier. Do you sew by the book? Thanks for sharing these thoughts, dear Ana-jan. You are always an inspiration to me! Gde sam naučila da šijem?